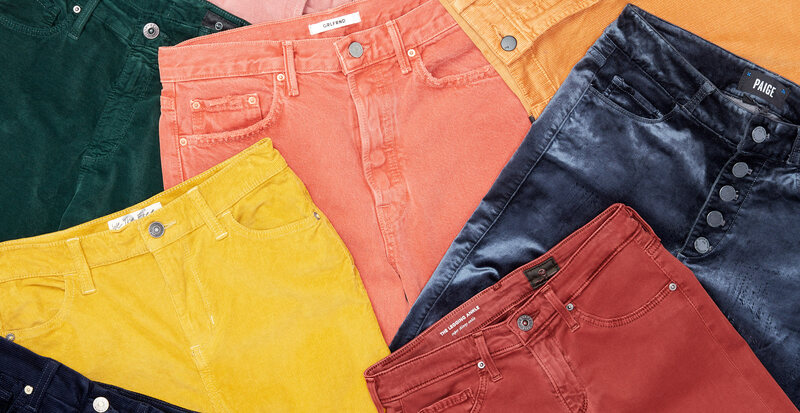 We love wearing denim all year, but fall always feels like the perfect time to give our jeans a seasonal upgrade. Rethink your classic blues this month with rich, new textures like velvet and corduroy in bold, attention-grabbing shades. To get you inspired, we asked our expert stylist Brianne to share her top picks for new, must-have jeans. The catch? They could be anything but blue denim. Take a look, and see how an unexpected color or fabric can completely transform a familiar favorite. If you’re not fully ready to go all-in with colored jeans just yet, experiment with deeper tones and opt for skinny or slim-fit silhouettes. “These will be your new go-tos, given how many different outfits you can create with them,” Brianne says. She suggests pairing your colorful skinnys with an oversized sweater for a cozy, casual look, or with a patterned blazer for something more polished. There’s something about velvet that just feels so regal. Upgrade your everyday outfits with a touch of glamour by going for a high-waisted pair of jeans made from the decadent material. “Because velvet pants are anything but understated, it’s important to let them shine as the star of the show by keeping everything else simple,” Brianne says. A solid-colored turtleneck in a contrasting texture or a tank-and-blazer combination should do the trick. Texture, color, and a unique silhouette? Count us in. These three design elements are great on their own, but feel ultra-special when found all in one piece, like these crop flare corduroys. “Don’t be afraid to pair your colorful cords with other trend pieces,” Brianne says. 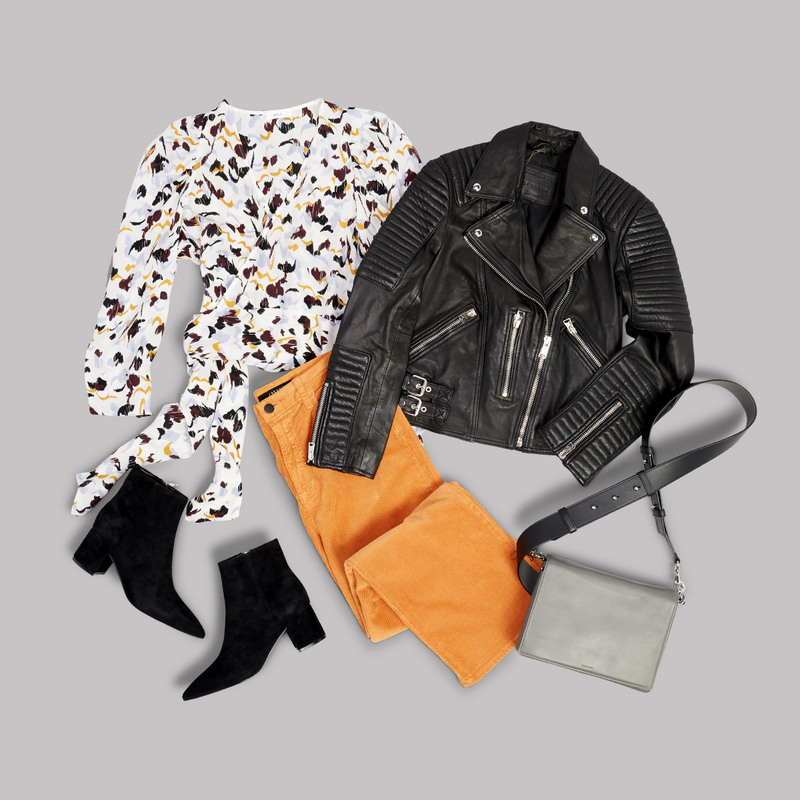 A printed blouse in complimentary colors and a sleek leather jacket work for both day and night.